Deb's Cup of Tea: Are We Done Yet? On purpose, I choose to live in an area where crystallized water droplets form in the lower atmosphere and decide they are going to have a party on the ground where I live. For the most part, I enjoy winter. I like to be out in it, within reason. I like to walk in the December snows before Christmas. When Carole was younger, making snow forts was lots of fun and the occasional snowball fight as an adult is not to be missed. But, I tell you what, when everyone on the block knows this guy by sight, because it so happens that he's assigned to our street, and he waves at us out there with our shovels, perhaps there has been too much frozen precipitation in the month of January. 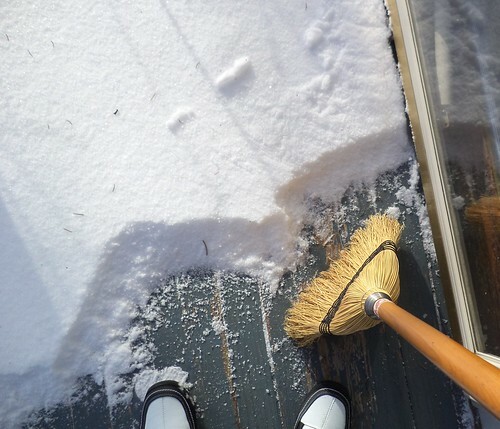 The water content of January's snow has been very, very low so getting up to four inches off the front steps or the back deck does not need to involve the shovel. Yet, as "easy" as this is, it's still rough on the body when you have to do it twice a week. As much as I tell myself that this is exercise, my body is screaming obscenities when I get done. I had a rheumatologist appointment last Friday. Prior to seeing her, I have to fill out an assessment sheet. They use this to track how well a patient is doing. The ebb and flow of RA is reduced to a number. That number can then be used to decide if a stronger drug regimen is needed. I hurt. I just do. I have kind of resigned myself to always having an ache or two. I will always, now and forever, be stiff getting out of bed. It will always, now and forever, take me 10 or more minutes to get going. But the achiness and pain of January seemed to be deeper than the usual achiness of RA. It was comforting to find out I was not alone. My doctor said all but 2 of her patients had complained about joint stiffness and pain. The beauty of winter notwithstanding, the cold and all the shoveling has caused inflammation which makes us hurt. Although my assessment was a couple points higher than last visit, it doesn't mean I need to look at a stronger drug. It means that winter has been hard on people with joint problems. She said she can't prove it and there is no literature to document it, but she suspects the cold constricts blood flow to joints and that reduced blood flow causes joints to stiffen. She put me back on prednisone for the month of February, just to get through what looks to be another tough month of snow, followed by cold. After leaving the office, I stopped by the grocery and then by CVS but the prescription hadn't been received. They would call Dr. Francis' office and have it ready on Saturday. But Friday into Saturday was to be a day of more snow, so I went nowhere on Saturday. Sunday dawned bright and clear. 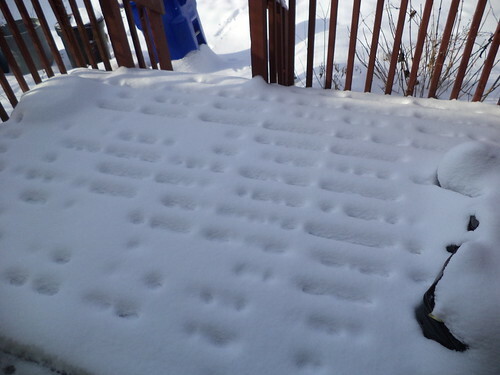 With a heavy sigh, I set about clearing the deck, front steps and up to and around the Jeep. 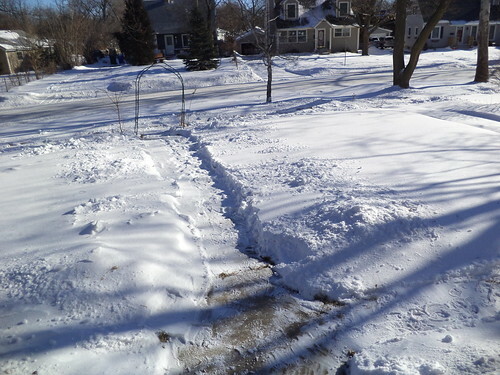 The snow was light and fluffy so I decided I would simply clear the drive, all of it, including the driveway apron. When that, and the sidewalk and the deck and the front steps were all done, I hopped in the Jeep, drove to CVS and picked up the prednisone. The ache is now in my very lower back, down by my tailbone. The prednisone combined with an aspirin helps me sleep at night and part of the pain goes away. I'm still stiff in the morning, probably more than usual, but my legs don't hurt and they did when I went to see Dr. Francis. I was thinking it would be nice to have a week of no additional accumulations, to let my body heal, but that is not to be. 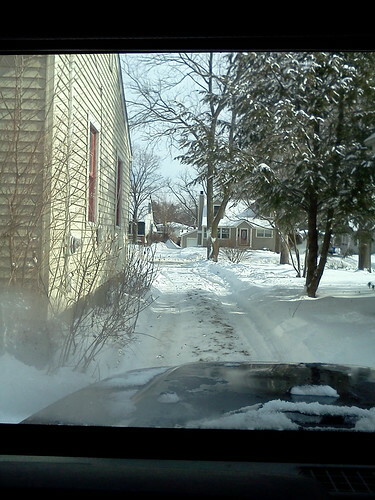 This morning, in spite of the weather predictions that I would be on the 3 inch range, I trudged through this to get to the Jeep. The knowledge that I need to shovel again to take the garbage and the recycling to the curb has me nearly in tears. I would happily send all of this to California. 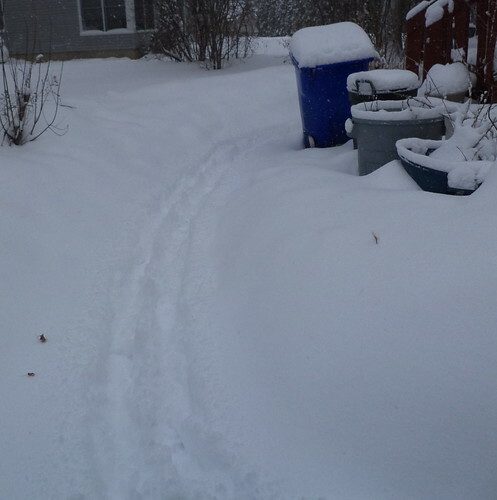 I know there is nothing I can do to change weather patterns, but that doesn't ease my sense of hopelessness and my body's almost instinctual reaction to start the aches now, before the shovel even touches the snow. And it's only February 5th. So, what to do? I get up at the office and walk around for 10 minutes. That helps. I have a couple days off upcoming. It's supposed to be partly cloudy and no snow. That will help, but before we get to that part, there is another major snowstorm coming which could dump 8+ inches on my location. We're approaching 60 inches, 5 feet, of snow this winter. I tell myself that this is normal. We have become so used to dry, snowless winters, due to global warming, that we forget what it's like to have to move the frozen water from one section to another. I'm more acutely aware of the effort to keep the walks and the drive clear. It's for me as much as it is for Tony, my Oberweis delivery guy, and the mailman. 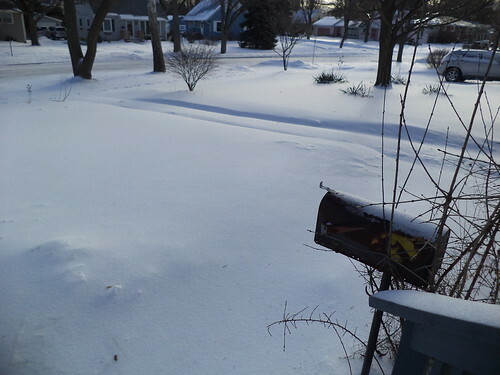 Yet, because I hurt, the addition of another foot of snow on top of what we have reduces me to tears. I had to start today with Dunkin because I couldn't think of another way to cheer myself up. This is one year I will be extremely happy to see spring arrive.